Telling stories with the moving image doesn’t happen in a vacuum. Neither does running a major school at a research university that happens to be in the heart of one of Los Angeles’ most storied communities. Every year, the School of Cinematic Arts hosts events to reach out to the South Los Angeles community. 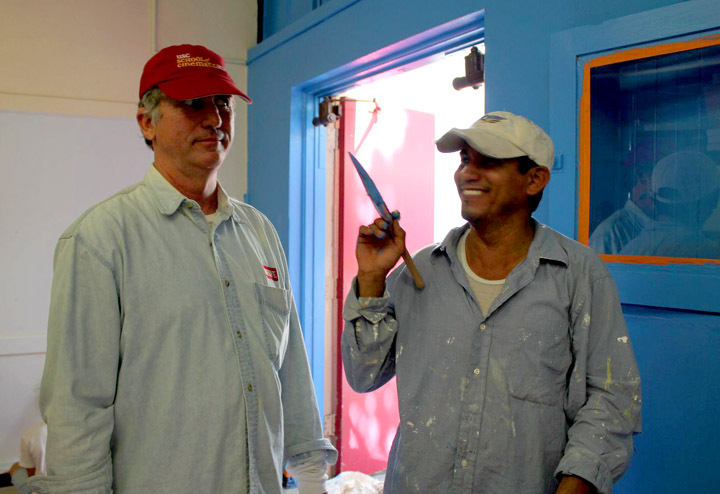 On September 29th a group of staff and student volunteers, led by Engineering Manager of Theatres and Classrooms at SCA Chris Cain, Foshay teacher John Midby and Wendy Milette from the My Hero organization painted a classroom at the Foshay Learning Center as part of the International Room 13 Project. Room 13 is an international network of student-driven creative studios founded in 1994 in Caol, Scotland. The initiative has expanded throughout Europe, India, South Africa, North America, Asia and other locations, to include 93 studios worldwide. As part of the Room 13 project, International Room 13 @Foshay is a student and professional artist managed, self-financed, sustainable, multi-media studio. The goal of the studio is to help student artists improve their skills as creators, entrepreneurs and 21st century creative thinkers. By doing this, students that would have, historically, had very little opportunity in the creative arts become a vital part of LA's art and creative scene. International Room 13 @ Foshay is the only art program at that School because of budget cuts.